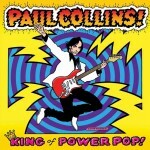 Ace power-popster Paul Collins (Nerves, Breakaways, Beat) has a new album coming out August 24th, humbly entitled King of Power Pop. To whet your appetite he’s released the track “Do You Wanna Love Me” for download. Album review forthcoming here in August, but for now, enjoy this new track! This entry was posted on Thursday, July 22nd, 2010 at 6:12 pm	and is filed under Free Download. You can follow any responses to this entry through the RSS 2.0 feed. Both comments and pings are currently closed.